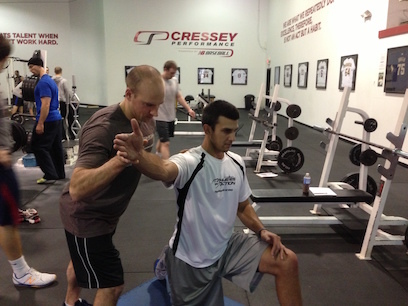 Today's guest post comes from Matt Blake, the pitching coordinator at Cressey Sports Performance in Massachusetts. Matt is an integral part of the Elite Baseball Mentorships team. I recently Tweeted out a picture of some mechanical changes a pitcher had made and it received a lot of responses. As such, I decided I would follow up with a little more depth and context to this particular picture to help shed some light on the thought process that goes into making mechanical adjustments. So, for starters, here’s the picture in question, with the left side being the original delivery and the right side being the revised version. Typically, when discussing pitching mechanics, I avoid using still shots, because they can be very misleading. In this particular case, there were some substantial changes that were made in this landing position, which I thought encapsulated a lot about the enhanced movement quality of the delivery as a whole, which we’ll unpack in further detail here. For those familiar with the pitching delivery, the first thing that should jump out at you is the extremely late arm action in the initial delivery. This could be classified as an “inverted arm action” at landing, where in this case, the elbow isn’t necessarily hyper-abducted (elevated) above the shoulder, but the hand is definitely below the elbow. In a Cliff's Notes version, this positioning is generally regarded as increasing stress on the shoulder and elbow. This is in part due to the orientation of the humeral head in the socket at landing, as it’s in a position of excessive internal rotation and pinned into the front of the socket. As a result, we’re not in an optimal position to get the rotator cuff to function to center the head for a clean ball in socket rotation. This is coupled with the fact that we’re adding more torque to the joint since we have more range of motion involved in getting the hand to full lay-back before accelerating to release. That being said, there are plenty of pitchers who throw very hard and have successful big league careers pitching with an inverted pattern, and the reason they throw so hard may very well be due to their inverted pattern, so you have to constantly weigh the risk/reward of making mechanical adjustments for pitchers. As an example, Billy Wagner had an inverted pattern and multiple injuries, but was hitting 100mph before it was industry standard to hit 100mph - and he accumulated 422 saves in a successful big league career. Where is this pitcher currently in the developmental process? What type of stress does he currently report during or after throwing? What can we gain by making adjustments? What do we have to lose by adjusting this current delivery? These are important questions to consider, because you’re obviously not going to take a big leaguer at the tail end of his career, and adjust what has got him to that point. Conversely, you might adjust a 15yr old high school pitcher, who throws hard, but has erratic command and reports a high level of stress after he’s done throwing. In this particular case, we had a sophomore in college, who had a track record of success in high school, and was looking to establish his role in a very competitive program with a strong history of winning. His contributions as a freshman were limited in part due to command issues and his velocity would be erratic going anywhere from 82-90mph on any given day. As I stated in the video, the crazy thing about this delivery is that for how extremely late that arm action looks in that still shot, it’s really a misrepresentation for how much I like the feel of this delivery as a whole. There’s a lot of quality movement that’s “loose” in nature, and this athlete has a good feel for creating “extension” in the throw, so we really don’t have to adjust the integrity of his movements, but more the timing associated with some of the actions, and at the crux of it, the athlete’s mindset for creating leverage in his throw. If you look at where this delivery starts to break down, it’s in the excessive “counter-rotation” of his shoulders that creates too much length in the throwing arm and that couples with an exaggerated extension of the back leg into landing. As a result, the hand can’t catch up and “get on top of the ball” at landing and our pressure into the ground ends up being poor. This combines to create an issue for the stabilization pattern as a whole now, because the front leg can’t brace to create a fixed point of rotation to anchor the throw, as it has to allow for the torso to translate forward in an effort to create time for the hand to get into position behind the ball. So, as you can see, by the front knee ending up working into a more flexed position, we’re diffusing the ground force reaction we’re trying to convert into rotational power, and the pelvis loses its leverage on that front hip, flattening out our rotation. When this happens, you’ll notice that the path of the hand is actually diverted wide instead of keeping an efficient driveline through the target. Without a firm landing position that allows us to accept force properly, and keep the rhythm of our sequencing intact, our command and velocity will continue to be erratic in nature. Once we identified these issues, we had to rule out that there wasn’t a mobility or stability issue that was limiting our ability to move through more functional positions. In this particular case, mobility definitely wasn’t the issue, and even though the stabilization pattern was currently poor, the athlete did have the ability to stabilize. It really just came down to his awareness for what he was trying to accomplish. So, once we came to agreement that these were things that could be fixed and would be beneficial to his development in the long run, we had to start re-organizing the focus of his repetitions. Anytime you’re making changes, it’s essential to understand root causes and not just symptoms. For me, the inverted arm action was a symptom of a misdirected focus in the delivery. We needed to make the focus less on length and extension in the throw and more on strength in the landing and properly sequencing his rotations through the chain. By creating a stronger stride pattern and tying the timing of the arm path into the lower half sequencing, we would have a more connected and repeatable delivery that had a more efficient stabilization pattern. Let’s take a look at what shook out over the next seven weeks and then we’ll discuss some of the altered components. Now, that being said, we definitely used versions of the “stride drill” to coordinate the rhythm of the back-hip rotation and arm action, and we did our share of step-behind shuffles to speed up his timing and learn to accept force properly upon landing, but if the focus on trying to create force into the ground and working from “top-to-bottom” on the baseball wasn’t in place, I don’t think either of those drills would have mattered. Changing his focus and “pre-throw vision” for what his ball flight should look like helped him organize his body into this revised delivery. By placing the importance on being “strong into the floor”, it didn’t allow him to put himself into these overly extended positions, whether it be the lower half or the arm action, as he came to understand these weren’t “strong” positions. Ultimately, understanding the importance of landing in a position that allowed him to accept the force and transfer it up the chain was crucial in this process. At the end of the day, the most important part of making any type of delivery change is getting “buy-in” from the athlete himself. It doesn’t matter what I think a delivery should look like unless the athlete understands and accepts why it’s important for him to make these changes, because ultimately he’s the one who has to throw the baseball. In this particular case, we had a college pitcher who is on the cusp of turning himself into an impact pitcher in a competitive college program. If getting himself into more efficient positions in his delivery allows him to command the baseball more consistently, and he can reduce the erratic nature of his velocity, he’ll give himself a real chance to be a reliable college performer and we can begin to entertain the possibility of becoming a pro prospect. All in all, I’m really proud of the work this athlete put in over the summer and I think these rapid changes speak volumes about the level of commitment he has to his development, as changes of this magnitude aren’t common in this time frame and they certainly don’t happen by accident. Needless to say, there’s still a lot of work to be done to “own” this remodeled delivery. It needs to become second nature and highly repeatable in order for this athlete to be able shift into a narrow-minded focus on just competing in the strike zone, but I’m certainly excited to see where his continued effort leads him. For more pitching discussion, you can follow Matt on Twitter. Looking for more video analysis and training insights like this? I'd encourage you to sign up for one of our upcoming Elite Baseball Mentorships. We have an upper extremity course in November, and you won't find a more intensive baseball educational experience. Amazing article and a great read! I watched for years instructors with good intentions give bad information. Kudos to you both Matt and Eric. Love what you guys are doing for the baseball community. What is the “stride drill”? Where can I learn more on how to access and correct the pitching motion? I use this drill with my pitchers to reinforce the correct mechanics and to have them really get their hips through before their shoulders to get the “torque” needed for velocity.